Azure Functions runs in two different plans: Consumption plan and Premium plan (public preview). The Consumption plan automatically adds compute power when your code is running. Your app is scaled out when needed to handle load, and scaled down when code stops running. You don't have to pay for idle VMs or reserve capacity in advance. The Premium plan will also automatically scale and add additional compute power when your code is running. The Premium plan comes with additional features like premium compute instances, the ability to keep instances warm indefinitely, and VNet connectivity. If you have an existing App Service Plan, you can also run your function apps within them. Both Premium plan and Consumption plan for Linux are currently in preview. If you aren't familiar with Azure Functions, see the Azure Functions overview. How host instances are scaled out. The resources that are available to each host. Instance features like VNet connectivity. You can switch between Consumption and Premium plans by changing the plan property of the function app resource. When you're using the Consumption plan, instances of the Azure Functions host are dynamically added and removed based on the number of incoming events. This serverless plan scales automatically, and you're charged for compute resources only when your functions are running. On a Consumption plan, a function execution times out after a configurable period of time. Billing is based on number of executions, execution time, and memory used. Billing is aggregated across all functions within a function app. For more information, see the Azure Functions pricing page. Always warm instances to avoid any cold start. Premium instance sizes (one core, two core, and four core instances). High-density app allocation for plans with multiple function apps. Information on how you can configure these options can be found in the Azure Functions premium plan. Instead of billing per execution and memory consumed, billing is based on the number of core seconds and GB seconds used across needed and reserved instances. At least one instance is required to be warm at all times, so there is a fixed monthly cost per plan that is active (regardless of the number of executions). Your function apps run continuously, or nearly continuously. In this case, an App Service Plan can be more cost-effective. Your code needs to run longer than the maximum execution time allowed on the Consumption plan. The premium plan preview currently supports functions running in .NET, Node, or Java through Windows infrastructure. Your function apps can also run on the same dedicated VMs as other App Service apps (Basic, Standard, Premium, and Isolated SKUs). App Service plans support Linux. You pay the same for function apps in an App Service Plan as you would for other App Service resources, like web apps. For details about how the App Service plan works, see the Azure App Service plans in-depth overview. With an App Service plan, you can manually scale out by adding more VM instances, or you can enable autoscale. For more information, see Scale instance count manually or automatically. You can also scale up by choosing a different App Service plan. For more information, see Scale up an app in Azure. If you run on an App Service plan, you should enable the Always on setting so that your function app runs correctly. On an App Service plan, the functions runtime goes idle after a few minutes of inactivity, so only HTTP triggers will "wake up" your functions. Always on is available only on an App Service plan. On a Consumption plan, the platform activates function apps automatically. Regardless of the function app timeout setting, 230 seconds is the maximum amount of time that an HTTP triggered function can take to respond to a request. This is because of the default idle timeout of Azure Load Balancer. For longer processing times, consider using the Durable Functions async pattern or defer the actual work and return an immediate response. To determine the hosting plan used by your function app, see App Service plan / pricing tier in the Overview tab for the function app in the Azure portal. For App Service plans, the pricing tier is also indicated. When the output from this command is dynamic, your function app is in the Consumption plan. When the output from this command is ElasticPremium, your function app is in the Premium plan. All other values indicate tiers of an App Service plan. Even with Always On enabled, the execution timeout for individual functions is controlled by the functionTimeout setting in the host.json project file. On any plan, a function app requires a general Azure Storage account, which supports Azure Blob, Queue, Files, and Table storage. This is because Functions rely on Azure Storage for operations such as managing triggers and logging function executions, but some storage accounts do not support queues and tables. These accounts, which include blob-only storage accounts (including premium storage) and general-purpose storage accounts with zone-redundant storage replication, are filtered-out from your existing Storage Account selections when you create a function app. To learn more about storage account types, see Introducing the Azure Storage services. In the consumption and premium plans, the scale controller automatically scales CPU and memory resources by adding additional instances of the Functions host, based on the number of events that its functions are triggered on. Each instance of the Functions host in the consumption plan is limited to 1.5 GB of memory and 1 CPU. An instance of the host is the entire function app, meaning all functions within a function app share resource within an instance and scale at the same time. Function apps that share the same consumption plan are scaled independently. In the premium plan, your plan size will determine the available memory and CPU for all apps in that plan on that instance. Function code files are stored on Azure Files shares on the function's main storage account. When you delete the main storage account of the function app, the function code files are deleted and cannot be recovered. When you're using a blob trigger on a Consumption plan, there can be up to a 10-minute delay in processing new blobs. This delay occurs when a function app has gone idle. After the function app is running, blobs are processed immediately. To avoid this cold-start delay, use the Premium plan, or use the Event Grid trigger. For more information, see the blob trigger binding reference article. The unit of scale is the function app. When the function app is scaled out, additional resources are allocated to run multiple instances of the Azure Functions host. Conversely, as compute demand is reduced, the scale controller removes function host instances. The number of instances is eventually scaled down to zero when no functions are running within a function app. A single function app only scales up to a maximum of 200 instances. A single instance may process more than one message or request at a time though, so there isn't a set limit on number of concurrent executions. For HTTP triggers, new instances will only be allocated at most once every 1 second. For non-HTTP triggers, new instances will only be allocated at most once every 30 seconds. There are many aspects of a function app that will impact how well it will scale, including host configuration, runtime footprint, and resource efficiency. For more information, see the scalability section of the performance considerations article. You should also be aware of how connections behave as your function app scales. 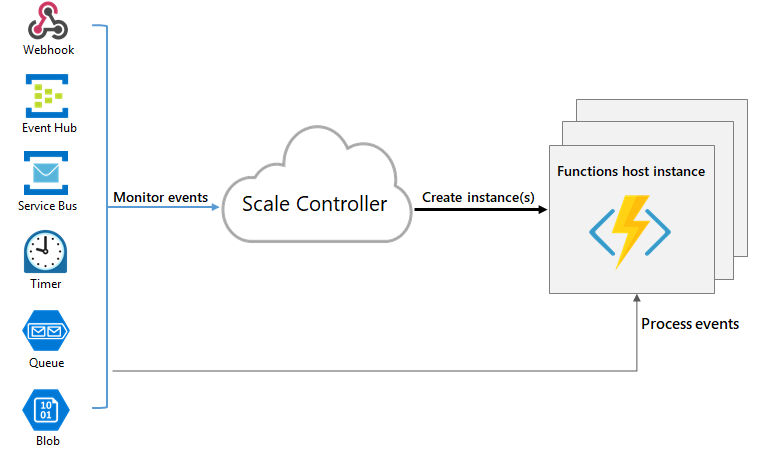 For more information, see How to manage connections in Azure Functions. Resource consumption in gigabyte-seconds (GB-s). Computed as a combination of memory size and execution time for all functions within a function app. Executions. Counted each time a function is executed in response to an event trigger. Useful queries and information on how to understand your consumption bill can be found on the billing FAQ.